Click here for our hydrangea growing guide! Click on image to go to the product page. Flowering hydrangeas are a telltale sign of summer. Nothing beats the beautiful sight of blooming hydrangeas in a variety of colors. The white, blue, pink or purple flowers paired with bright green foliage look gorgeous in every summer garden. While we’re typically used to seeing low growing hydrangea bushes, how great would it be to see hydrangeas on trees? Well, the good news is, you can! Here is how you can grow a hydrangea tree. Hydrangea paniculata, also known as Grandiflora, produces white conical flowers instead of big spherical blossoms. With some pruning and proper care, it can grow up to 25 feet tall! Grandiflora, known among gardeners as Pee Gee Hydrangea, is your best bet for growing a hydrangea tree. Before you plant, set yourself up for success. Check your hardiness zone, as hydrangea trees thrive in USDA plant hardiness zones 5 through 8a. Hydrangeas prefer full sun for most of the day and a bit of afternoon shade, so be sure to choose a generally bright spot. Hydrangeas typically thrive in rich, porous, moist soil. Enrich the soil with Espoma’s All-Purpose Garden Soil and add Espoma’s Bio-tone Starter Plus to ensure healthy growth. Water thoroughly and if planting multiple trees, be sure to space each hydrangea at least 3 to 10 feet apart. One of the most important parts of growing a hydrangea tree is pruning. The main difference between a hydrangea shrub and a tree is training, pruning and proper care. The ideal time to prune is early spring. Remove old twigs that didn’t produce healthy growths and remove suckers from the trunk of the tree. Keep your tree neat by cutting branches short enough that they each have only two or three nodes (small bumps on the branch that signify growth). Your hydrangea tree will need a lot of sun, but provide some shade on especially hot summer afternoons. More sun means more water, so keep the soil moist to avoid wilting leaves and blooms. Prune your hydrangea tree in the spring before peak growing season. If you love your hydrangeas and want to see more than a typical shrub, growing a hydrangea tree sounds like the next step for you! Hydrangeas are generally pest and disease free, but when your flowers are looking less than stunning, it’s hard not to panic. Learn about common hydrangea problems and fix them. Your plant will be back to blooming in no time. 1. Scale: One of the most common pests, scale can best be identified by their clusters of white eggs on stems. Treat with Insect Control. 2. Slugs: Slugs attack young hydrangeas especially. Look for holes with ragged edges in leaves. The best way to know if slugs are the culprit is to go out and check plants at night. Lay slug traps around plants. 3. Aphids: If you see small black or green bugs on leaves you may have aphids. Treatments include gently spraying leaves with a hose or spraying with Insect Control. 4. Beetles: From Japanese to Rose chafers, beetles are known for eating petals and leaves. Handpick beetles and drop them in soapy water or spray with Insect Control. 5. Fruit Worm: If you see holes in the leaves of mature hydrangeas, you may have fruit worm. Check the underside of the leaf for this caterpillar-like bug. Knock them off and check leaves for eggs. Black Spots: In extra wet conditions, a leaf-spot fungus may appear. Don’t worry, it doesn’t harm the plant and new growth shouldn’t have spots. If black spots appear in dry conditions, you may be overwatering your hydrangea. Powdery mildew: While this doesn’t usually kill hydrangeas, it can cause leaves to drop. Look for a gray, powdery coating on foliage. Remove and destroy any affected plant parts. Apply Neem Oil 3n1 as needed. Rust: This fungal disease looks like rust colored spots on the underside of leaves. The tops of leaves turn brown or yellow and eventually fall off. If the problem isn’t severe, prune off and destroy the affected leaves. Otherwise, use a rust specific organic fungicide such as Neem Oil 3n1. To prevent many diseases, use a soaker hose or spray nozzle to water the roots of plants. And water in the morning, so any water on the leaves has a chance to dry. Additionally, many problems are a result of lack of water. If flowers turn brown and die quickly or leaves have brown, brittle spots around the edges, you may be under watering. Still have questions about getting your hydrange to bloom, pruning or more? Learn all of our hydrangea secrets in our hydrangea growing guide. Hydrangeas are supposed to be forever gorgeous! The most flawless, must-have flowers in the garden! Yet, you may see black spots on your hydrangea’s leaves. Or worse yet, blooms are turning brown! Stick with us, and we’ll have your garden favorite looking tip-top again. Here’s how to easily fix those common hydrangea problems. 1. Not a Spot! When it’s unusually rainy (or if you’re overwatering), hydrangeas’ leaves develop unsightly, black spots. This is a pretty harmless leaf fungus with a scary name — Cercospora! Prune away heavily affected areas and spotted leaves to prevent the fungus from spreading. 2. Will to Wilt. Hydrangea blooms drooping or wilting? Most likely, your plant is soaking up too much sun and not getting enough water. Check to see if the soil is moist 1-2” deep. If not, water deeply. For best hydrangea care, repeat weekly. Add a bit of mulch to help conserve water, too. If that’s not the case, check your soil’s nitrogen levels using a soil test. Add necessary amendments. 3. Brown Blooms. If your hydrangea blooms are turning brown too soon and quickly petering out, they likely need more water. Ditto if your flowers wilt during the day and don’t bounce back at night. To confirm, look for brown spots on leaf edges. To fix, deeply water hydrangeas once a week. 4. Holey-Moly Foliage. Fruit worms and slugs munch holes through hydrangea leaves. Lift up a holey leave. If you find what looks like a caterpillar, that’s a fruit worm! Get rid of them with soapy water. If nothing’s there, it’s likely slugs. You can hand pick them at night — or give them a night cap. Bury a plastic cup near the hydrangea, so the rim is level with the soil. Then, fill the cup halfway with beer. 5. Blooms Be Gone. No flowers on your hydrangea? You likely pruned your hydrangea at the wrong time — and cut off all its new blooms. Skip the pruning this year, and check out our tips for pruning hydrangeas so you never prune hydrangeas at the wrong time again. 6. Purple Pout. If your leaves have purple spots, remove the affected leaves and branches. If the entire leaf is purple, your soil may not have enough phosphorous. Perform a soil test and amend as needed. Abracadabra! Your hydrangea problems will be gone soon. Then, you can focus on all the best parts of growing hydrangeas — like admiring those big, fluffy flowers! To learn more about hydrangeas, check out our organic growing guide. Find the right hydrangea for you by choosing one that loves sun, blooms all summer or is perfect for beginners. Large, beautiful hydrangeas are a great addition to any landscape. Their bold colors make them perfect for freshly cut or dried flowers. Getting off to the right start in the right location is the difference between a hydrangea bush that blooms for years and one that never does. Get the beautiful blooms you desire with these hydrangea planting tips. Where should I plant my hydrangea? Choose a spot with moist, well-drained soil. Hydrangeas can grow from 4’ to 12’ in height depending on the variety, so plan accordingly. Most hydrangeas benefit from some shade, especially in hot climates. Too much shade means your hydrangea may not grow flowers. Check the plant tag to find out how many hours of sun your hydrangea should be getting per day. Panicle hydrangeas tolerate more sun than do other species. And if you live in a region where it gets seriously hot, your hydrangea will need more shade than those grown in colder zones. Hydrangeas in southern climates especially need frequent watering to tolerate that stress. If you’ve noticed your hydrangea has stopped blooming in recent years, it may be time to evaluate the location. Make sure hydrangeas are still receiving enough daily light and check the growth of nearby trees. Consider moving the hydrangea to a sunnier spot. Get Ready to Plant. Once you’ve found the perfect spot, dig a hole twice as large as the hydrangea’s container. 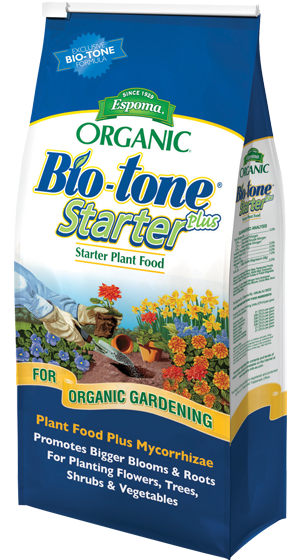 Mix in an organic starter plant food, such as Bio-tone Starter Plus, to keep roots strong. Add 1” of compost or Espoma Organic All-purpose Garden Soil to help with nutrients and drainage. Place the hydrangea in the hole at about the same height it was in the container, spreading its roots wide. Backfill the hole with soil and top with 2-3” of mulch. Water Well. After you plant, water the hydrangea until a puddle forms. Water twice a week for a month. Then water deeply once a week until fall. The Finishing Touch. Feed blue hydrangeas with Holly-tone to keep the soil acidic. Otherwise, opt for Flower-tone. For the best hydrangea care, feed 2-3 times throughout the growing season, which is spring until fall. Learn all of our hydrangea secrets in our hydrangea growing guide. When we picture hydrangeas — with their larger-than-life blooms and immense foliage — we naturally envision large plants. Believe it or not, though, hydrangeas come in not one, not two, but three sizes! No matter how much space you have, find the perfect-sized hydrangea for you. You can even grow hydrangeas in a container. 1. Small Has It All. Pick a hydrangea that will thrive in your small space. Dwarf varieties are petite beauties that pack a powerful punch. Scroll through our Hydrangea Variety Guide to find the right dwarf hydrangea for you. Then, find a spot that matches the amount of light they need. 2. Big, Bold and Full of Holes. Select a pot or re-purpose a container to make a statement. Just make sure it has drainage holes. 3. Solid Gold Soil. Hydrangeas need well-draining soil to thrive, so select a high-quality, organic potting soil Bonus points if it has Myco-tone™ mycorrhizae, which uses 30 percent less water than other soils. 4. Plant with Power. If you want to grow blue hydrangeas, mix in Espoma Organic Soil Acidifier. For pink hydrangeas, add Espoma’s Organic Garden Lime. If you have it, add compost! Then fill planter with potting soil, and plant the hydrangea at the same height it was previously growing. 5. Establish Essentials. When growing hydrangeas in containers, water when the top 1” of soil is dry — or when the hydrangea begins to wilt. For best hydrangea care, feed once a year around June or July with an organic fertilizer. If you want a blue hydrangea color, feed with Holly-tone. Small space, big blooms! Just think of how lovely your hydrangeas will look glistening in the sun at your Memorial Day party or twinkling in the moonlight during summer garden parties! Hydrangea care, specifically pruning, doesn’t have to be complicated. Honest. Even those who have been gardening for years still have questions about how to prune hydrangeas. Discover our secrets to pruning hydrangeas. Hone in on Hydrangeas. Before you prune hydrangeas, you need to know which type you have. If you planted a hydrangea from our Hydrangea Guide, your answer is just a click away. Take the quiz below to find out what type of hydrangea you have and when to prune. Does your hydrangea bloom most of the season? Yes? You have a new variety of hydrangea, such as an Endless Summer. If you’re planning on re-shaping, prune in fall after the final blooms. However, you can prune these at any time. Does your hydrangea have blooms in early summer that fade away by mid-summer? Yes? You have a bigleaf, modheap, lacecap or oakleaf hydrangea that blooms on old wood. Prune these right as their flowers begin to fade to maximize next year’s blooms. Whatever you do, don’t prune in the late fall, or you’ll remove next year’s flower buds. Pruning Old Wood Hydrangeas. Cut off any dead, diseased or deformed canes. Also, remove any branches that rub. Cut canes off close to the ground. If the hydrangea is older and has smaller blooms, remove up to 1/3 of the oldest canes. If the hydrangea is too tall, cut off the tallest canes. Does your hydrangea start to bloom in mid-to-late summer and flower until the first frost? If yes, you’re the proud owner of a panicle or smooth hydrangea that blooms on new wood. Prune in winter or early spring before they start growing. Pruning New Wood Hydrangeas. For the biggest flowers, prune shrubs to the ground. Over time, this pruning method weakens the plant. If you want to keep hydrangea’s long-term health in mind, cut back canes to 18-24”. Also, prune canes to 18-24” if you’ve noticed your hydrangea flops to the ground due to heavy blooms. Do you have a climbing hydrangea that grows upward? If yes, prune in late spring or early summer. Skip pruning during their first year, though. Pruning Climbing Hydrangeas. When pruning, remove any dead, diseased or rubbing branches. P.S. You can still can deadhead hydrangeas at any point. There you have it! Now you know how to prune hydrangeas. Impress your friends with this knowledge or by teaching them how to change hydrangea color!